It is clear from the opening scenes of “The Equalizer 2” that director Antoine Fuqua is not interested in regurgitating what had come before. Compared to the predecessor, this story is an attempt to explore Robert McCall, former Marine and intelligence agent turned Lyft driver, in new ways, to open him up, and to make our protagonist’s world feel a little bigger. By comparison, it is faster-paced, more suspenseful, and certainly more entertaining. Look at the way the director stages action scenes. Instead of going for standard shootouts, the journey from setup to catharsis unfolds like a thriller; it actively works to immerse the viewer in an experience—even through the experience offers nothing new—by finding creative ways to hit familiar notes. McCall is once again played by the first-class Denzel Washington. It is smart that screenwriter Richard Wenk provides the actor occasional dramatic moments because the performer is the type to milk silence to his advantage, particularly when McCall’s deceased wife becomes the subject of conversation. A great example occurs early in the picture when McCall gets a visit from a longtime friend (Melissa Leo) who is aware of his past life. As McCall reminisces about his wife, Washington decides to shut his eyes; his body is left with us his but his mind, his spirit is transported to a time and place that is long gone. Subtle but powerful instances like these elevate the material in such a way that is atypical in action-thrillers. Although originally based on a mid- to late-eighties television series, Washington makes the character his own. Several subplots are juggled in the air with seeming ease: a girl (Rhys Olivia Cote) who has been kidnapped by her father, a young artist (Ashton Sanders) torn between continuing his education and joining a gang, and a Holocaust survivor (Orson Bean) who hopes to provide enough proof for the courts that the person on a multimillion-dollar painting is in fact his sister. Fuqua allows these subplots to simmer and we wonder how these disparate strands would, or could, come together. Observe closely and recognize that, in a way, each one has something to say about McCall’s personal life, particularly his definition of justice and morality and why each one must be corrected. A case can be made that at times these subplots do get in the way of providing a smooth and consistent rising action. Although I can acknowledge this shortcoming, I enjoyed that McCall’s journey of solving the aforementioned strands is not a straight line. It would have been easier to set the subplots aside once the central story kicks into full gear. It certainly is the more familiar route. “Revenge is never a straight line. It is a forest,” according to key character in Quentin Tarantino’s “Kill Bill.” And indeed, “The Equalizer 2” is a revenge film; justice, or punishment in this case, must be exacted to those who attempt to get away with their crimes. We know what must happen: McCall will set things right. Still, there remains delicious irony in every one of the perpetrators’ deaths. 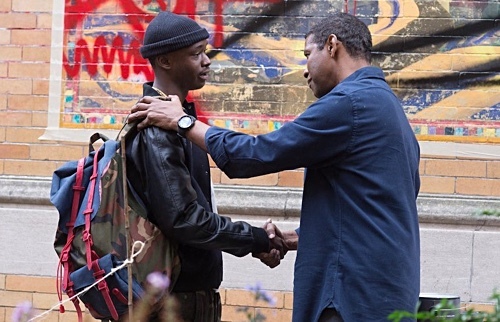 Those looking for a deep exploration of one man’s morality are likely to walk away from “The Equalizer 2” with disappointment. Although dramatic elements are there, when broken down to its essence, the work remains an action film. And so entertaining action sequences and showing bone-crunching violence—with proper context—matter more than providing a gradient of right and wrong. It is possible that ardent fans of the first film may require to warm up to the sequel because it offers a different personality. And yet—it is still worth seeing exactly for this reason.